All the trustees of Building Schools for Africa would like to thank the Dragon School in Oxfordshire for their splendid donation of over £235. 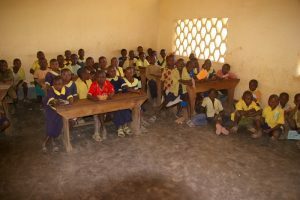 This will buy 10 benches for primary school children – which will mean 30 of these children will no longer either have to share five to a bench, or have to sit on the floor while they try to do their lessons – as in the picture below. It is such a generous thing for school children in the UK to do, to raise money to help their peers in Africa. We would like to thank all the children who paid for the privilege of not having to wear their uniforms (!) and to the School Council for choosing our charity to help.